How to select stand up inflatable SUP paddle board. 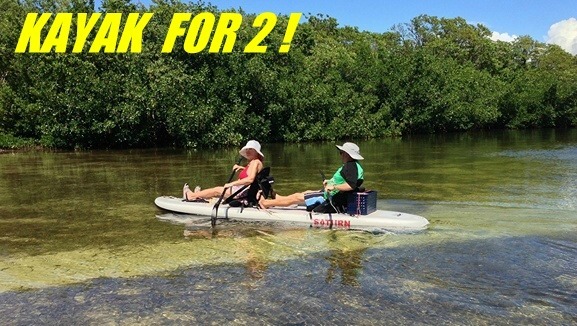 2 people can ride large volume 12' Saturn Inflatable Paddle Board! Once you catch up with the idea of paddle boarding, you will obviously want to purchase an Saturn inflatable paddle board of your own. But due to the availability of immense varieties of paddle boards, it becomes difficult to make the selection of the right one that will be suitable for us. Before purchasing you must consider the basic purpose of your paddling. Some people use it for regular exercise purposes to keep them fit and flexible while others use paddle boards for sports and racing purposes. Here is a list of different factors within inflatable paddle boards that must be considered while purchasing. We bet this will be beneficial for you. Check out the Paddle Board Hull types. The primary role of any inflatable SUP is played by the hull or the main body of the paddle board. This will determine how the paddleboard will perform in water. There are two major types of hull. One is the displacement hull and the other is planning hull. Planning hull SUP Paddle Board: This will be best suitable for those who want to weave through the great ocean waves. These types of paddleboards look similar to the surfboards. The basic advantage of the planning hull designed paddle boards is that they tend to be much more stable in water. Thus, it is advised by experts that the panning hull paddle boards are best suited for the beginners. Displacement Hull SUP Paddle Board: These are mostly used by the experts as they are perfect for long distance travelling and racing. The pointed end at the top helps it to move really fast slicing the waves, thus it is mostly used in sports. The next factor that you must look out is the weight and volume carrying capacity of any paddle board. Any SUP paddleboard must be perfectly suitable for your size and if the board is not able to displace the correct amount of water according to your weight, it may tilt at any time which can cause accidents. Thus, it is really important to take care of the board volume and weight capacity. The volume of paddleboards is expressed in liters which depicts the amount of water displaced by the board. The higher volume of water it can displace, the more weight it is able to carry. The third factor that must be taken care of is the length of the paddle boards. While considering the length, it must be kept in mind as to where are you going to travel with the paddleboard. Riding ocean waves require different paddle boards than racing on a calm lake. The short boards are perfect for surfing. These are perfectly designed for the kids. The medium boards are suitable for the calm lakes and also used for racing and sports. The long boards are best suited for touring and they are also faster than medium sized boards as they tend to travel much straighter. This board is perfect to move through a predetermined straight track. So it really helps to consider all these facts before you go on to buy any Paddle board. Understand the purpose of using it, and make a smart choice.